But ultimately it is because these systems make increased efficiency a possibility and enable a business to grow on any scale without affecting communication or functionality. Digital receptionists, extensions, company directories, routing of calls and managing customers are all options with the business phone system. There are two common deployments of the system, which include a hosted or virtual system and the self-managed hosted version. There are specific benefits that come from using each. Which system will work best for you will depend very much upon your business and how it works, and of course what and why you need the system. To decide which system you wish to install, it is important to know the advantages of each so that you can choose the one that suits you best. If you choose a virtual PBX system then you will be working with a phone system that is predominantly used in smaller organizations and takes no time to set up. Typically, all you need is an internet connection and a phone to set up this system. In smaller organizations that use the Virtual PBX system, it is held off site but for self managed, self hosted PBX systems, it is held on site. A virtual PBX system, or business VoIP service, is less expensive primarily because the service is shared with other users and customers, as is the equipment that accompanies it. This makes it even more beneficial for smaller businesses with smaller budgets. Whereas, per-seat pricing, is dependent on the numbhttps://www.slingshotvoip.com/wp-admin/post.php?post=541&action=editer of employees (or team members) that you wish to include in the system. Per-seat pricing is great for companies looking for fixed, predictable monthly costs. Per-seat pricing is also more favorable for service type businesses like consulting and legal firms, call centres, and similar organizations. With either pricing models, if your business should grow and you require more users, it is pain-free to add an extension without inuring extra costs. If you, or someone from your team is tech savvy, the alternative is to install and manage your own VoIP server, self-hosted system. You can choose between a virtual server on the internet, or a server (pc) sitting in your office onsite. You can easily take advantage of an open-source solution, Asterisk, that will provides all the features that an enterprise phone system offers, like call routing, voice mail, and interactive voice recordings. Along with the server and software, you will also need a phone number (local or toll-free) that is connected and routed to your VoIP system. You can obtain a phone number from DID providers that will route all inbound and outbound to and from your server. You can get a list of DID providers here. With a server and phone numbers, you are all set. From here on in, all you will need to do is program the system to your hearts desire. 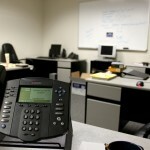 Learning curve can be fairly quick, but a phone system is not a set it and forget it type of office equipment. All of the above mentioned is time. With a phone system, as soon as you set it, you typically forget it. There is not much things that change throughout a year, except employees who are joining or leaving the company. With a hosted phone system, that is simple to change at no extra cost. Funny enough, it was not long ago, before G-Mail, when companies deployed their own email server like Exchange. The cost of maintenance was high and not to mention the the costs of an outage, or worse case scenario, a full replacement and recovery. How long could your business go without your email server, let alone your phone system. Once all this is added up you should expect to pay more than you would with the virtual system and so self-hosted systems are usually more suitable for larger firms with larger budgets. It is important to note, though, that there are certain risks associated with using the virtual system, resulting from the server is located off site and so the user has no direct control over it. This lack of control does increase the risk of security and makes the reliability of the system more of an issue. Equally, there are issues with a self managed hosted system, because the server sits onsite it can make maintenance an issue for the organization to manage, which can be quite expensive over time. Update: read my recent article on 11 Benefits to Switching to a cloud-based business VoIP. As the article says, there are advantages to both premise and cloud based phone systems. A startup company looking for less than 10 phones and low out of pocket cost would be ideal. An established mid sized entity with 150 users would probably benefit better with a premise Phone System with a PRI. Great point Chris. For 150 users within a single location, on-premise and a PRI would suffice!